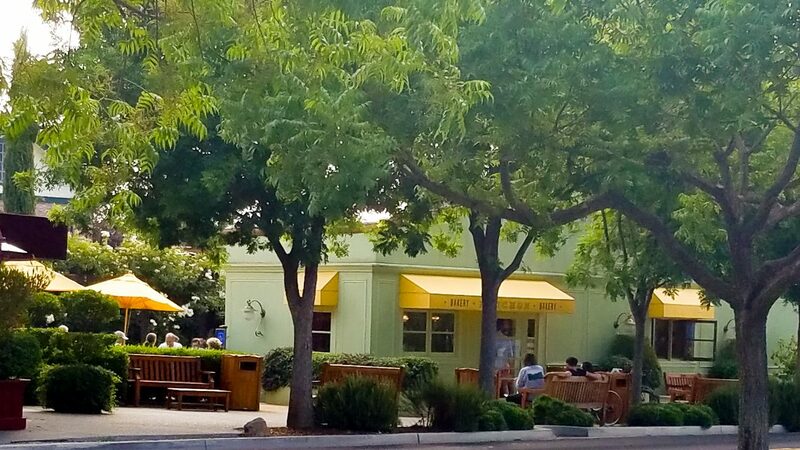 When in Napa, the best place to spend your morning, before heading out for wine tasting, is Yountville. 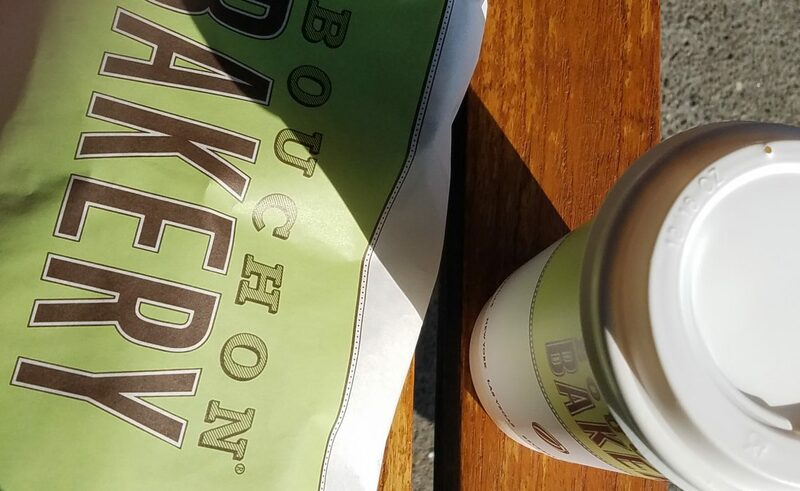 Bouchon Bakery….Ahh… I live in Vegas and there are two Bouchon Bakeries at the Venetian, so I am luckier than most to be able to have these delicious pastries closer at hand than most, but really there is nothing like a Café au Lait and a Pain du Chocolat while sitting on a bench outside Bouchon Bakery in Yountville in the morning. You often start outside on the sidewalk, making friends as you exchange the duty of holding the door for the line that trails out of the tiny building. Once inside you can watch the bakery though the glass windows as they make the bread and pastries, while you await a close enough spot in the line to see the pastries in the display case. 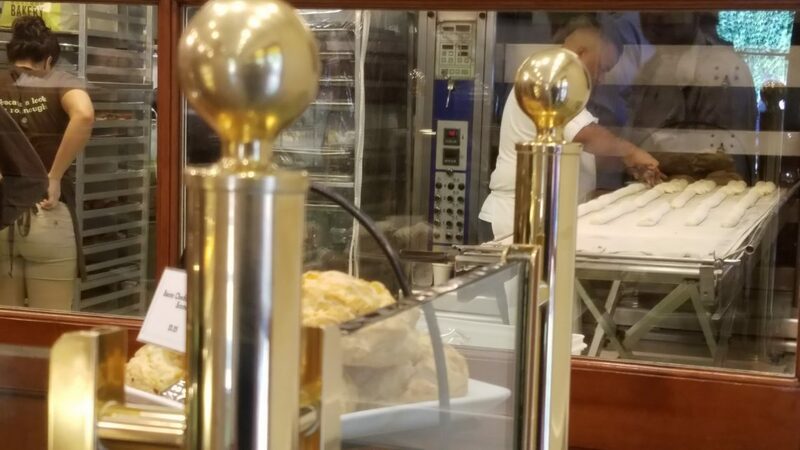 Once there you are mesmerized by all the beautiful pastries, which to choose? Then you must quickly decide on your drink (this part reminds me of the Starbucks in Time Square). The staff bustles behind the counter, maneuvering around each other in their morning game of twister as they fill orders. You politely duck back to await your name being called and move 5 or 6 times to allow others to grab a napkin or a fork from the counter behind you. 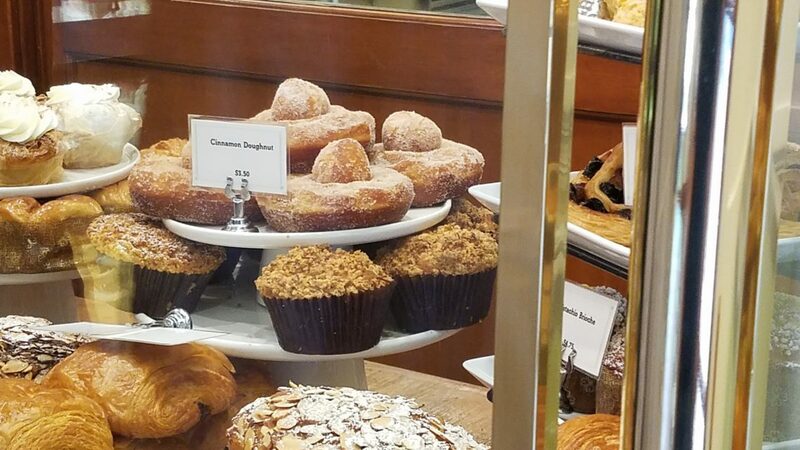 This bustle could feel stressful anywhere else, but you’re in Yountville, so everyone smiles sweetly with an underlying sense of bliss for the deliciousness that is coming and the wonders of the day ahead. Once handed your parcel of pastries, you scoot outside to find a seat. This trip had us there on a Saturday, and we were lucky that a bench opened up quickly. 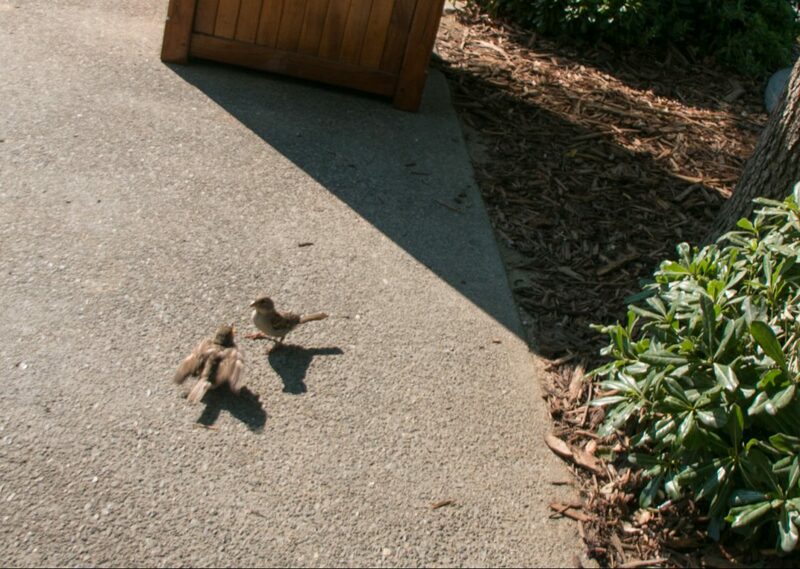 Immediately the sparrows stop by to demand crumbs. I’m so blissful, I can’t deny them. Then suddenly my pain au chocolate is gone. I nurse my café au lait to extend my reason for staying. Finally, we vacate to allow someone else a little of this bliss. But the morning doesn’t end there. It’s cool and comfortable. 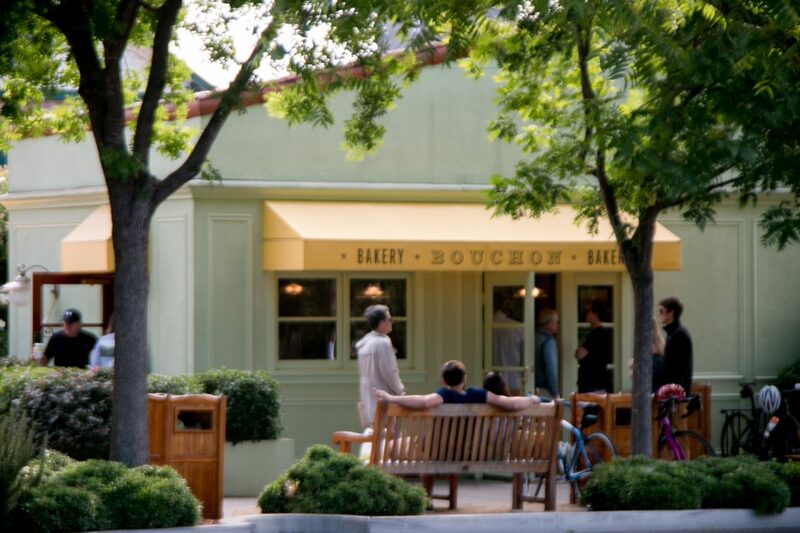 The birds are chirping and Yountville is the perfect place for a morning stroll. 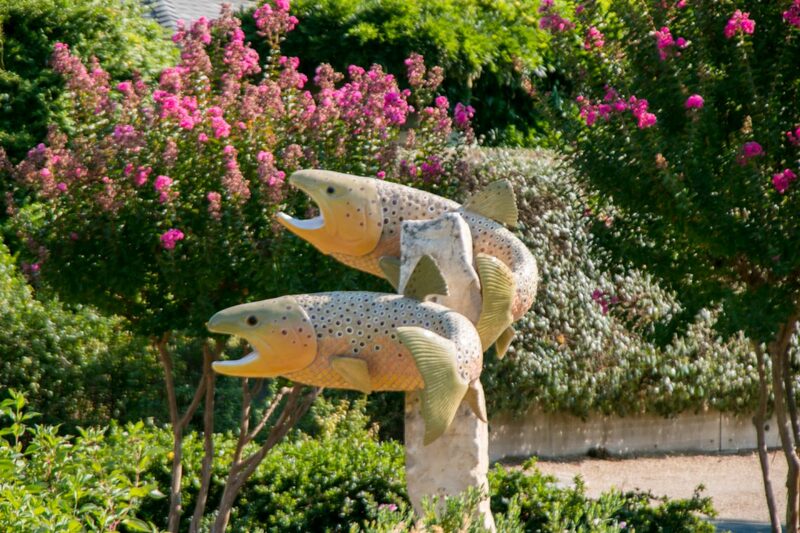 The city is dotted with public art, and grapevines and then there is the French Laundry Culinary Garden. And strolling is part of what this place is about. 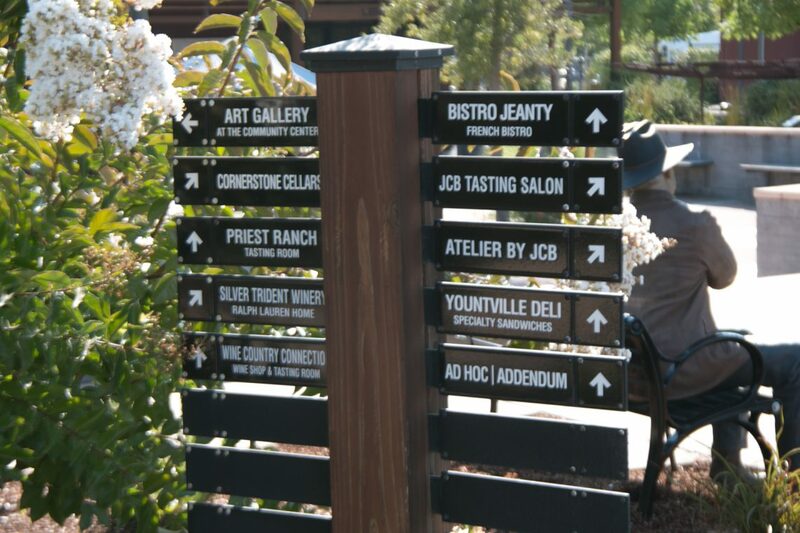 If you visit the Yountville website, the first words you read are “Welcome to Yountville! Here we embrace the old world Italian custom “Passeggiata” – an appreciation for the art of stroll and all the discovery and comfort that comes with it.” So, to embrace the local culture, we strolled. 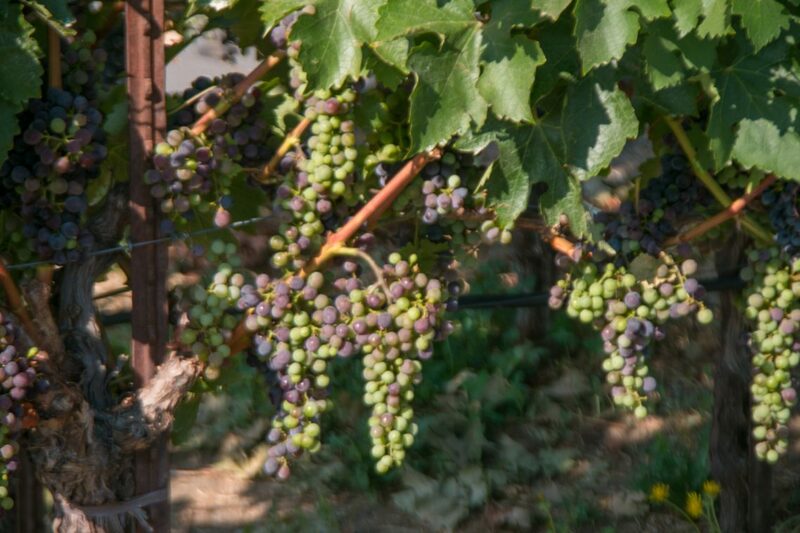 First…a little history on Yountville. Yountville and the surrounding area, in the early 1800’s was owned by Mexico. In 1836, George C. Yount, the city’s namesake, got a land grant from Mexico that ran the width of the Napa Valley from the current city of Yountville, north to the southern edge of St. Helena. George named the area Caymus Rancho. He was the first to plant grapes in Napa Valley and laid out a village with a public square that he called “Yountville”. The city is dotted with public art. 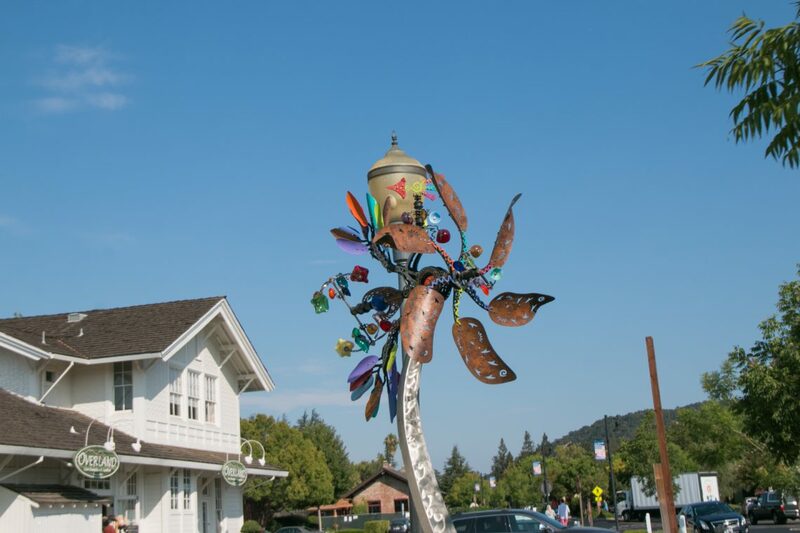 You can find a map for the Art Walk on the Yountville City Site. 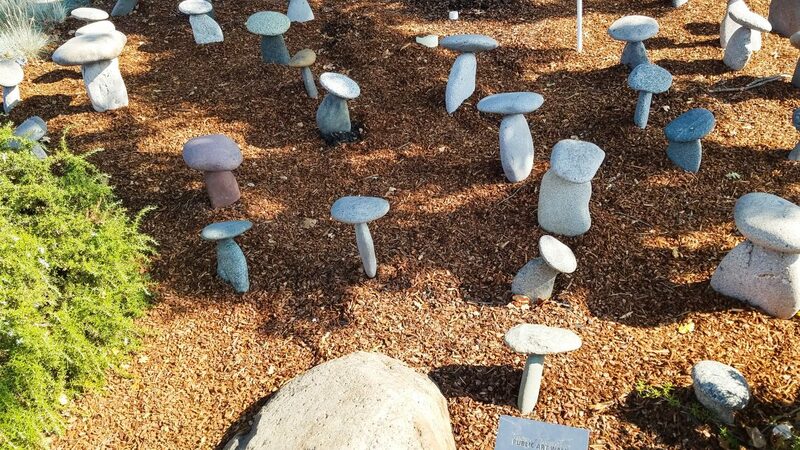 I was enamoured with the Rock Mushroom Garden by Napa Valley Artists Rich Botto. 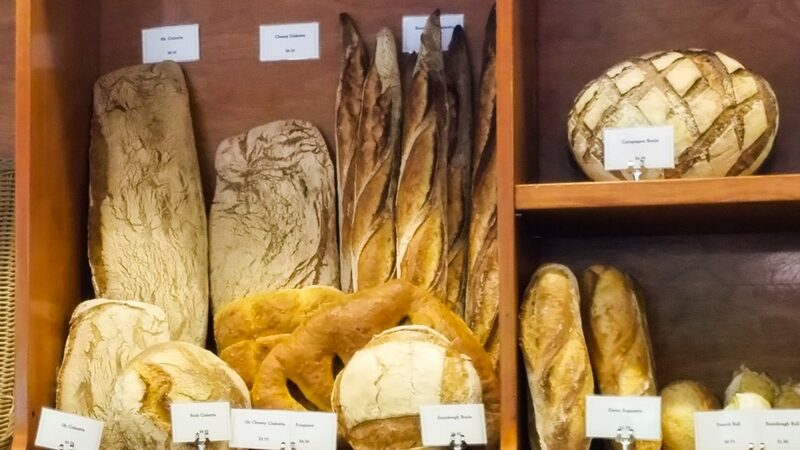 As you stroll through town, you will find the V Marketplace across the street from Bouchon Bakery (and of course Bouchon, the restaurant). 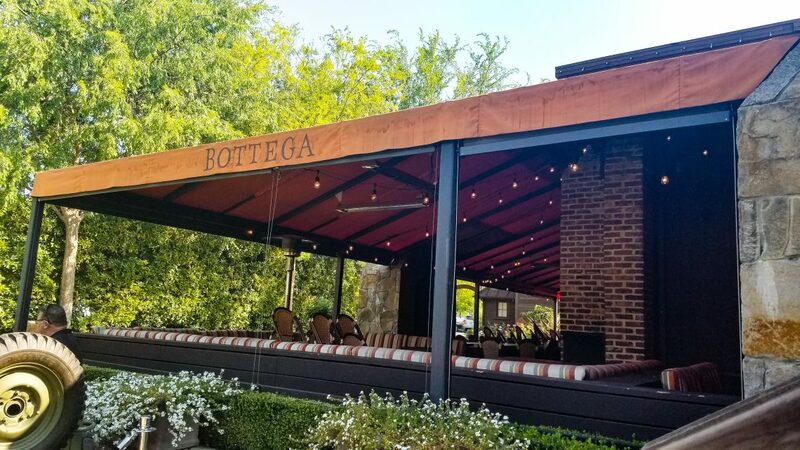 This Marketplace houses Michael Chiarello’s restaurant Bottega as well as multiple specialty shops. This spot has some history also. 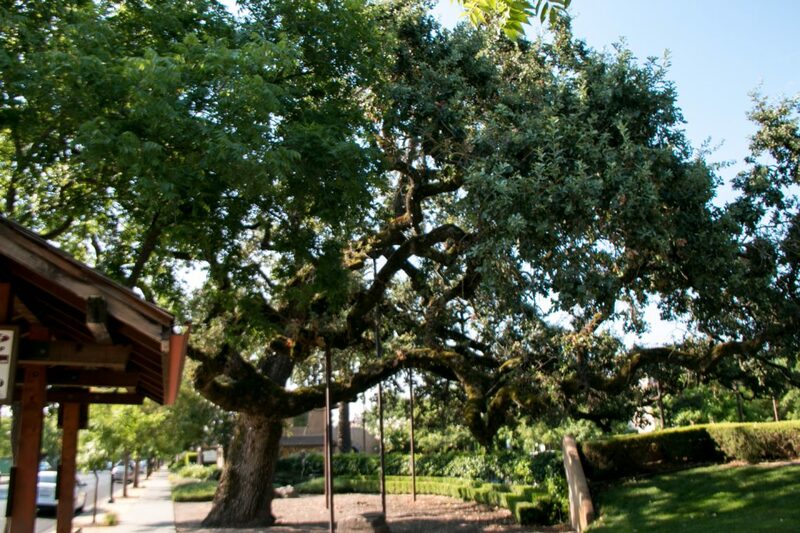 In 1874 this was the site of the first winery in Napa Valley built by Gotteib Groezinger. The three massive stone buildings Groezinger built now house beautiful specialty shops with apparel, home decor, jewelry, art as well as restaurants and tasting rooms. The structure encompasses gardens with fountains and often hosts events. The city is also dotted with grapevines here and there, it is after all, their biggest industry, and the vines were beautiful with grapes in veraison as we strolled. There is also a large oak tree in the in the center of town, branches shored up by posts, that provides shade over a park. We were strolling, but there is plenty here to side track you, tasting rooms, shops, galleries, bistros and then of course, some of the finest restaurants in the country. And this was just the beginning of our stroll. 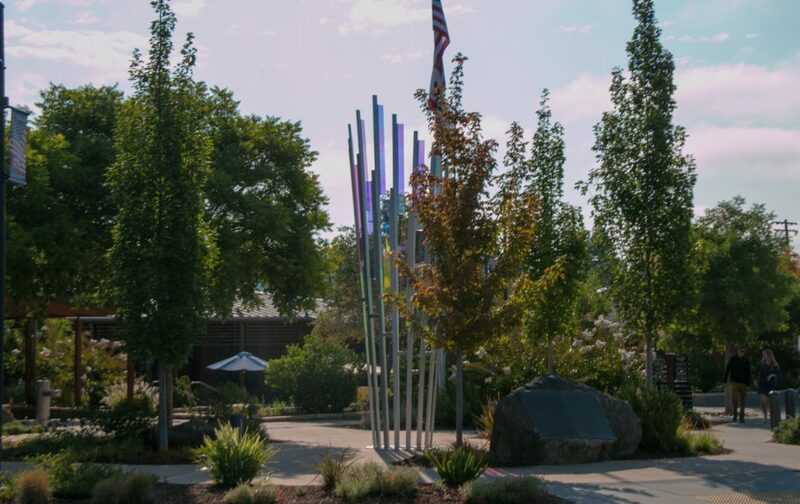 Next we will stroll down Washington Street to visit the Culinary Gardens of the French Laundry. 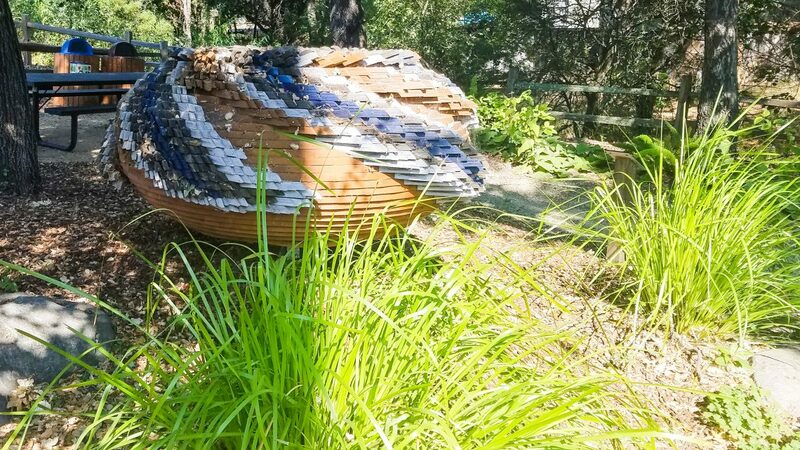 For more on Yountville visit the Yountville site where you can find details on places to stay, things to do and upcoming events. Thanks for the wistful stroll down memory lane! Glad you enjoyed it Don! 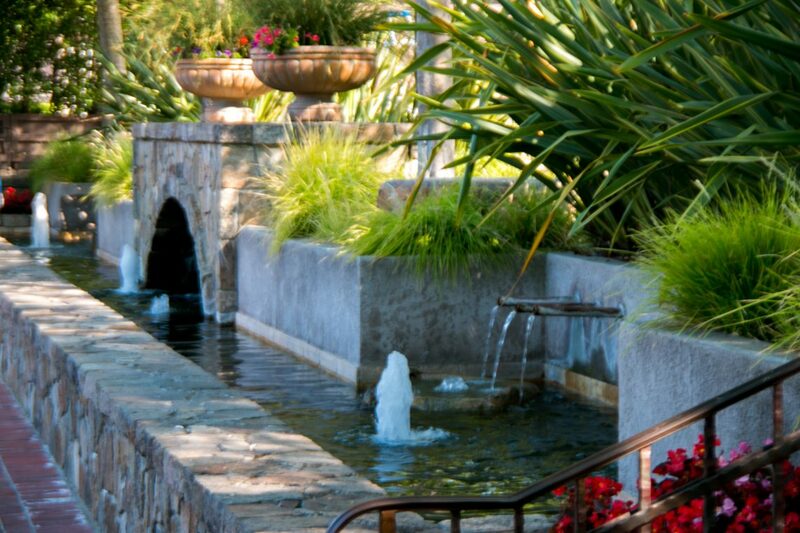 Tomorrow we will post our stroll to the French Laundry Culinary Gardens. It was a short but wonderful visit to Yountville. Ah, Yountville. My very first trip to Napa and I’ll never forget Bistro Jeanty. Thanks for the reminder that it’s time to go back and re-introduce ourselves to all of your recommendations-Cheers!